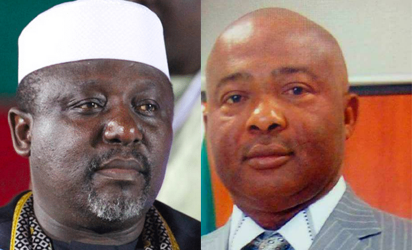 OWERRIâ€”GOVERNOR Rochas Okorocha of Imo State and his partyâ€™s governorship candidate in the 2019 election, Senator Hope Uzodinma were yesterday locked in a war of words over using the governorship election to fight for immunity from criminal deeds. The contention came as the Presidential Committee on the Recovery of Federal Government Assets gave Senator Uzodinma a deadline of 8.00 p.m. yesterday to appear before it or face another arrest. Meanwhile, the contenders for the governorship ticket were yesterday shifting from pressing buttons in Abuja to turf battles in the state. After fruitless efforts to assert himself on the governorship ticket of the APC, the erstwhile chief of staff to Governor Okorocha, Uche Nwosu arrived Owerri yesterday, with an assurance that hope was still on the way for him. His assurance came as the Allied Forces arrayed against him and his father-in-law, Okorocha marshalled out what was yesterday, described as preparations for a heroâ€™s welcome for Senator Hope Uzodinma, the official candidate of the party.